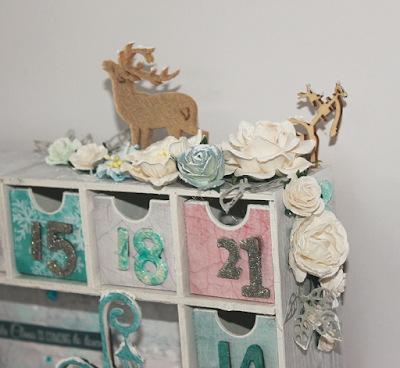 As a Design Team member, I got the Advent Block calendar (SB2316). I decided to use the Silver Bells collection, to decorate the advent calendar. Silver Bells collection is a great vintage collection, perfect with the soft colours. 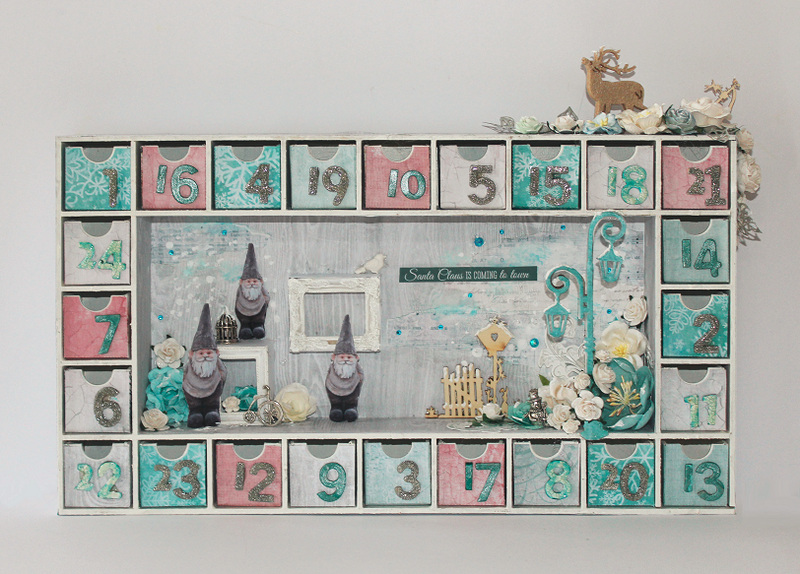 The numbers are Kaisercrafts chipboard Alphabet 3 (CD109). I have colourd the numbers with KaiserMist, Glitter or cracle paint. 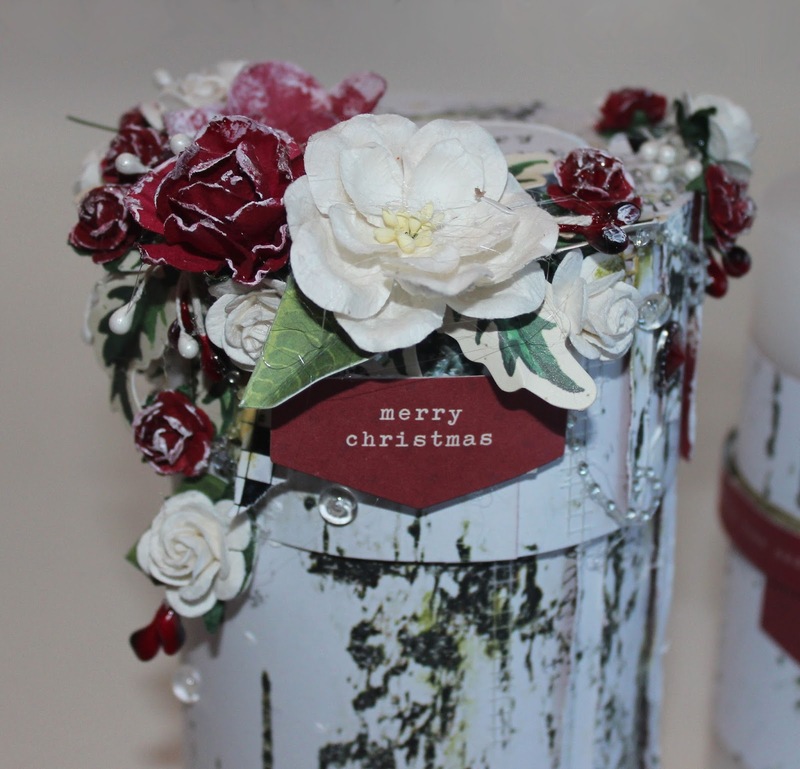 I have used gesso on the flowers, to create a snow effect. The lamp is a diecut made with one of Kaisercraft's dies (Street Light DD513). The gnome, is a photo of my frosty garden gnome. 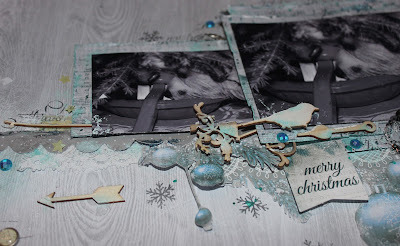 Kaisercraft Materials used: Advent Block SB2316 | Paper Silver Bells: Good Tidings P1926 | Baubles P1927 | Believe P1928 | Wonderland P1929 | Carol P1930 | Merry Christmas P1934 | Paper Pad: PP979 | Clear stamps CS237 | Collectables CT837 | Paper Blooms: Sea Breeze F631 | Coconut F627 | Decorative Dies Street Light DD513 | Chipboard Alpha 3 CD109 | KaiserMist Antique GoldKM102 | Stencils Christmas Quarters T623. 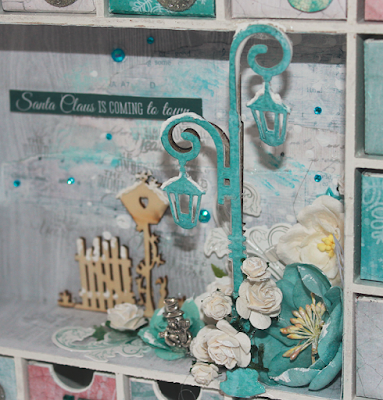 This a card I created for the September blog post for Kaisercraft. I wanted to create a simple Christmas card, using the Tag Pack for the Silver Bells collection. 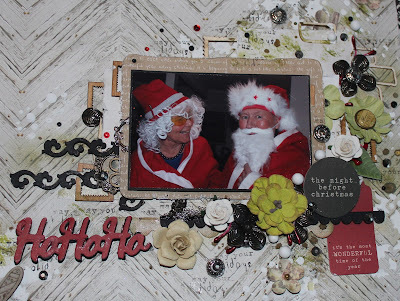 The motive is a Christmas tag. I have used one of Kaisercraft stencils and Gesso to create some snow effect on the background. 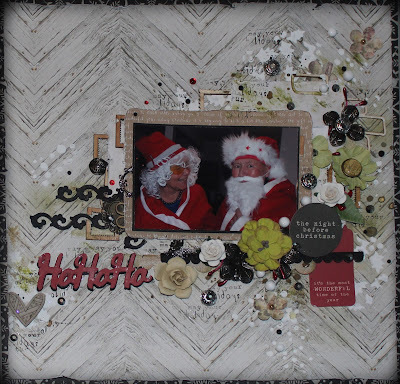 I have used simple swirls, created with a dies from Marianne design (Creatables - Anjas Vintage Swirls) and leaf diecuts (my own design). 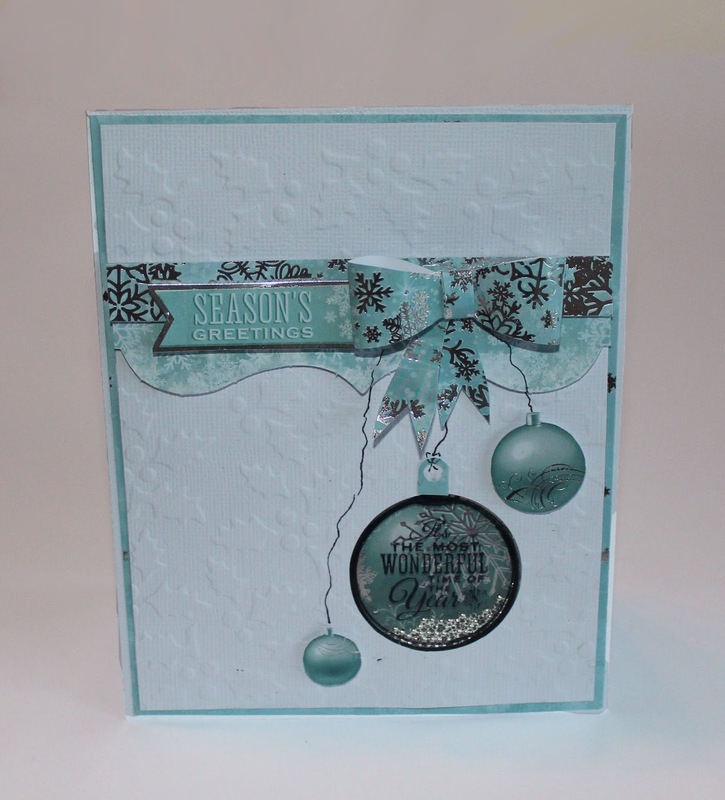 Kaisercraft materials used: Paper Pad PP979 | Tag Pack EM425 | Paper: Good Wishes P1933 | Paper Blooms Fairy Floss F640| Lace White EM926 | Pearls Pewter SB791 | Stencils Christmas Quarters T623. 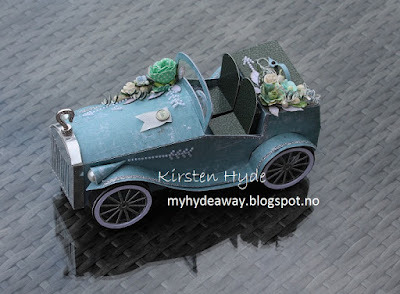 Today, I have got a new blogpost over at Kaisercraft's blog. I have used the brand new Generation collection, and created a layout with a photo of my best friend and me. The photo was taken this summer, and it is showing the view out of the Oslo fjord in the background. 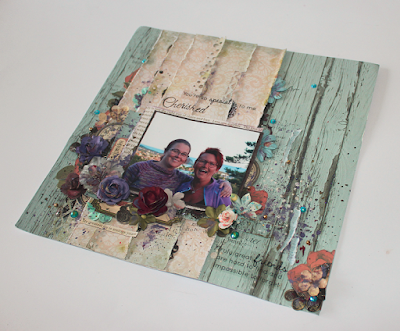 The Generations Paper Pad has a super set of papers in soft colours, perfect for layouts. I have used a mix of flowers and KaiserMists. I have also used a lot of the collectables in between all the layers. Paper Pad PP227 | Clear stamps CS239 | Collectables CT839 | Ink Pad IP717 | Paper Blooms: Grape F665 | Clear Stickers Inspirational ST927 | Stencils Christmas Quarters T623. I hope these collections inspire you. A year ago. I made this vintage car. This was made by creating a Silhouette file after one of my old templates. 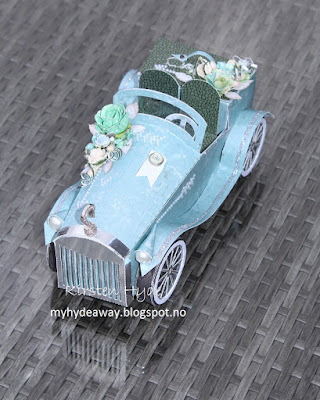 Several people has asked for a tutorial, to build the car from the templates or from the cutouts made by the Silhouette. 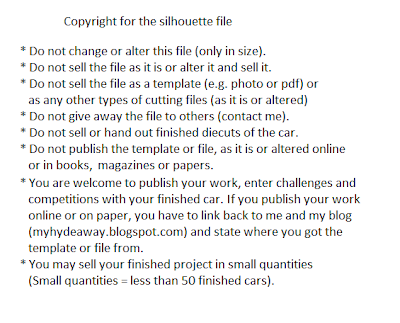 If you would like the silhouette file (studio file), please contact me. Today, Kaisercraft Design Team is showing Home decor items with the Home for Christmas Collection. 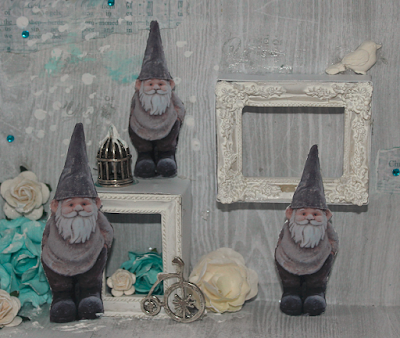 I wanted to create something that can be used as a small Christmas gift. 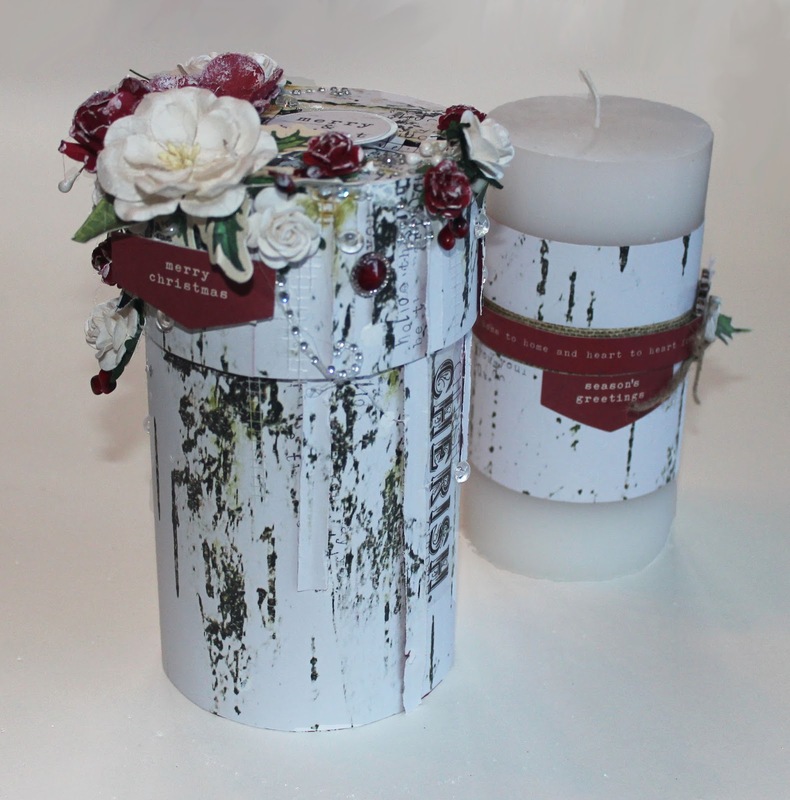 I decorated a candle, and made a gift box for it. Flowers are from Wild Orchid and Kaisercraft. The text is a sticker, and texture has been added to the box. 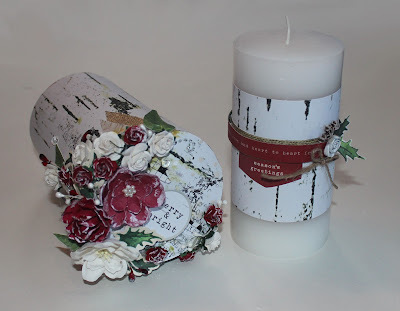 If you create something similar - remember to remove the paper around the candle before you light the candle. Kaisercraft Products: Papers: P1938 Eggnog, P1935 Poinsettia, P1940 Decoration and P1943 Laurel | PP980 Paper Pad | CT838 Collectables | CS238 Clear Stamps | P664 Red Paper Blooms | ST916 Clear stickers Delicate words. Last night, I created this mixed media mask as a different "card " for young girl, that was celebrated today. This is a mask from Panduro, and I have mounted a wooden stick to one side of it. 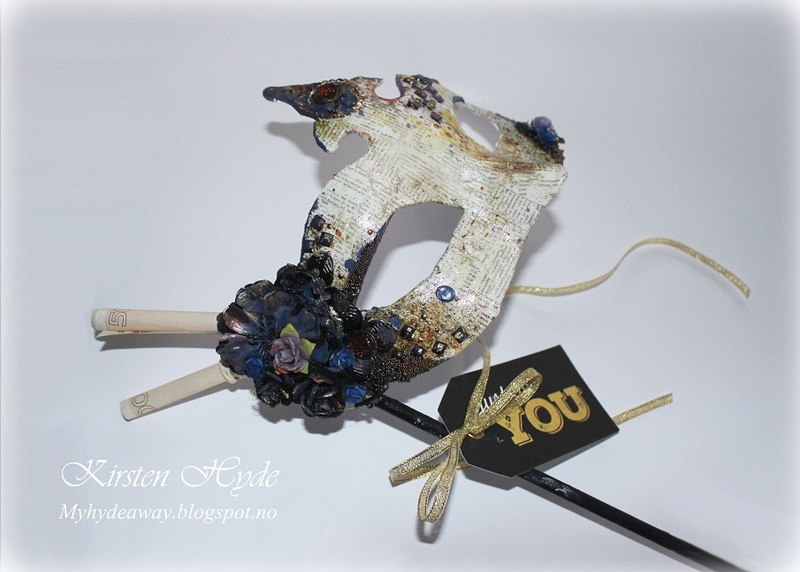 The mask is covered with paper from Prima. 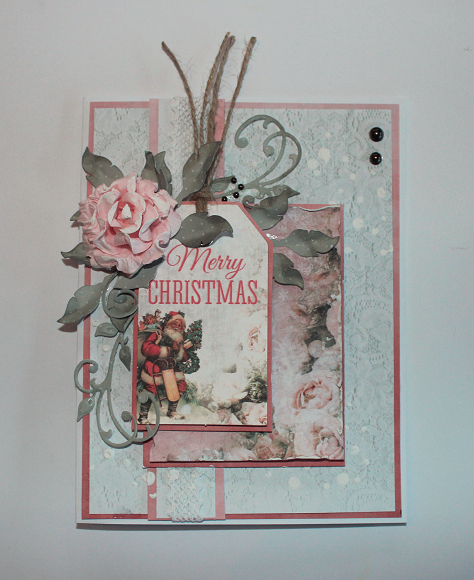 I have used metal embellishments and flowers from Prima and Wild Orchid. Then I sprayed with Prima's Color Bloom spray mists and KaiserMists and added different other mediums, Finnabair's glitter and microbeads. 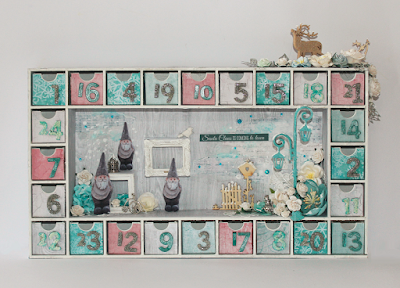 Today, Kaisercraft's design team are showing you white, shabby chic Christmas layouts with the Silver Bells collection in Kaisercraft's blog. 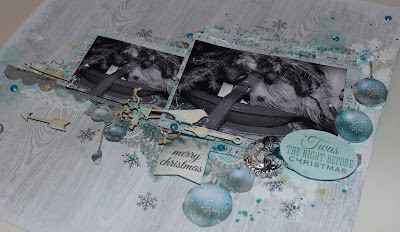 I made a layout with a photo of my Jack Russell, taken the first Christmas we had her. For her, it was quite natural to see the Christmas tree foot with water, as her water bowl. 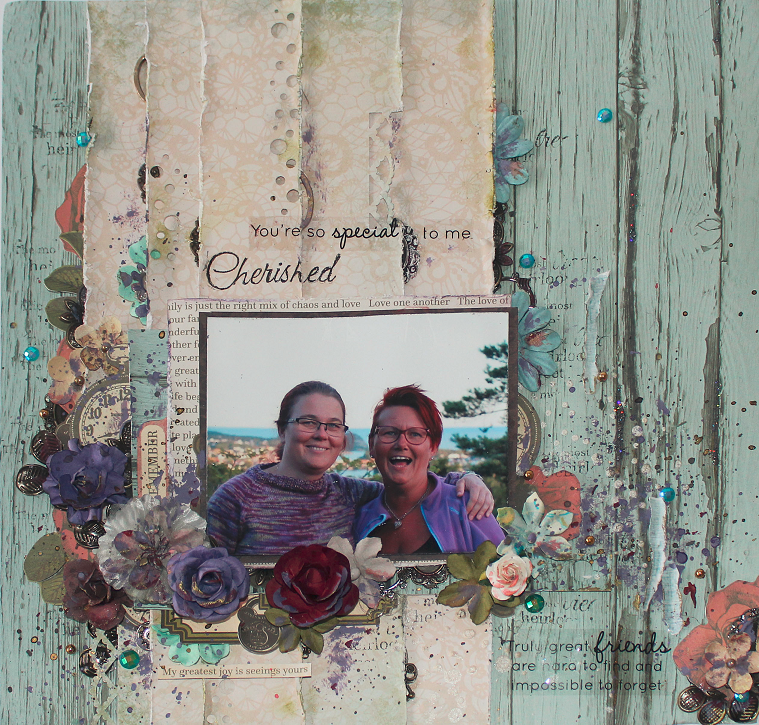 The layout has been layered. 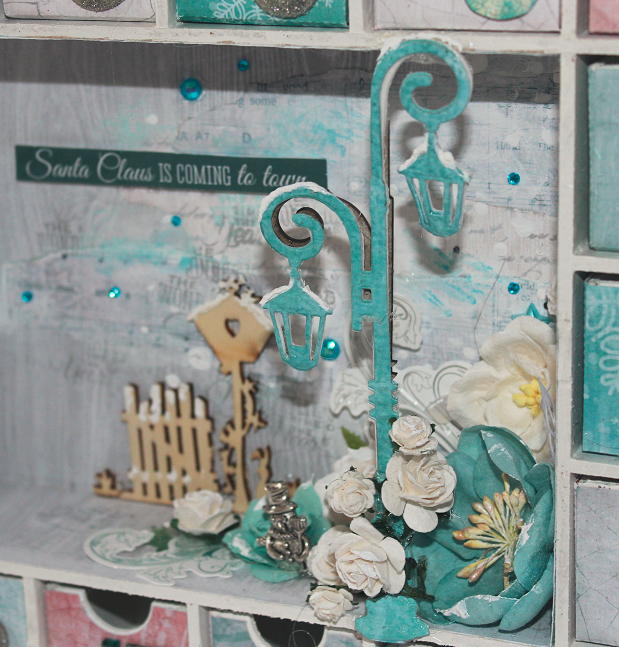 I have used layers of 3D tape to create some depth to the layout. 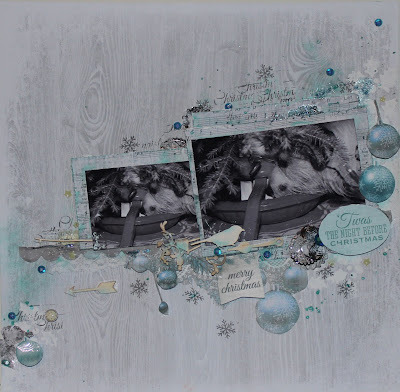 Kaisercraft Products: Paper: P1926 Good Tidings | P1929 Wonderland | PP979 Paper Pad | CT837 Collectables | CS237 Clear Stamps | Ink Pad: IP727 Lagoon | Template: T623 Christmas Quarters. 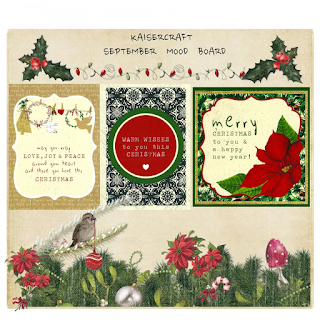 Silver Bells collection is one of Kaisercraft's wonderful September collections. 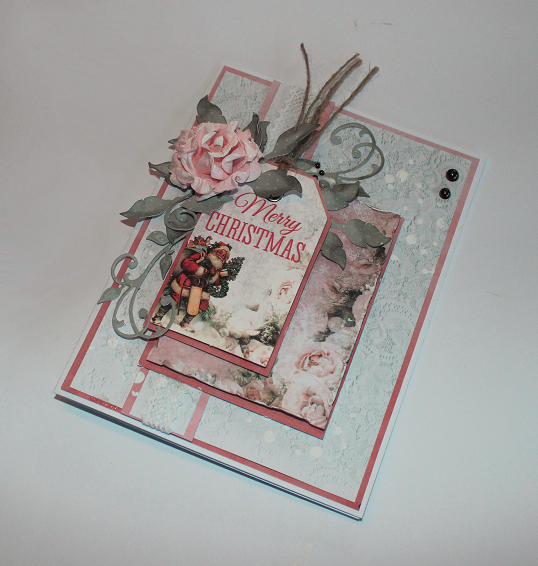 Today, the Design Team is showing cards with the paper pad and stamp set in Kaisercraft's blog. 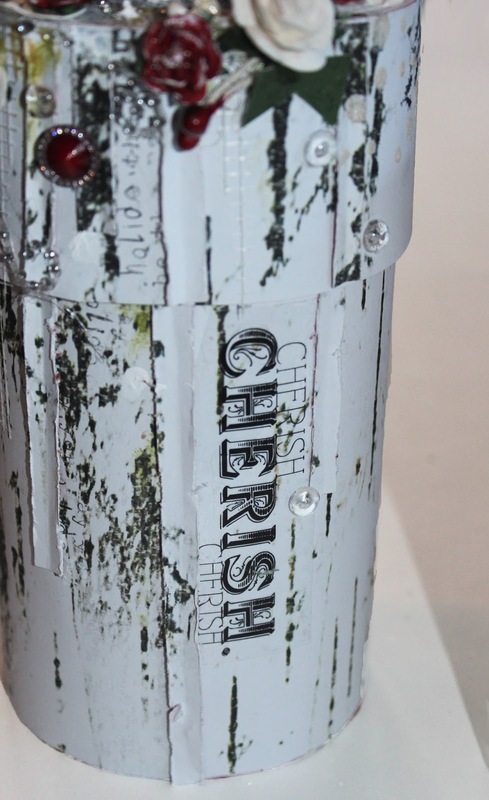 I have created a shaker cards, with small silver beads inside. 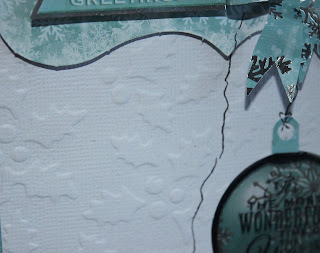 I have stamped a Christmas ornament onto acetate, and glued the acetate behind a circular hole. Then I added some space for the beads, just by adding 3D foam tape at the edge of the inside of the hole, before I glued the top panel onto some of the blue patterned paper from the paper pad. 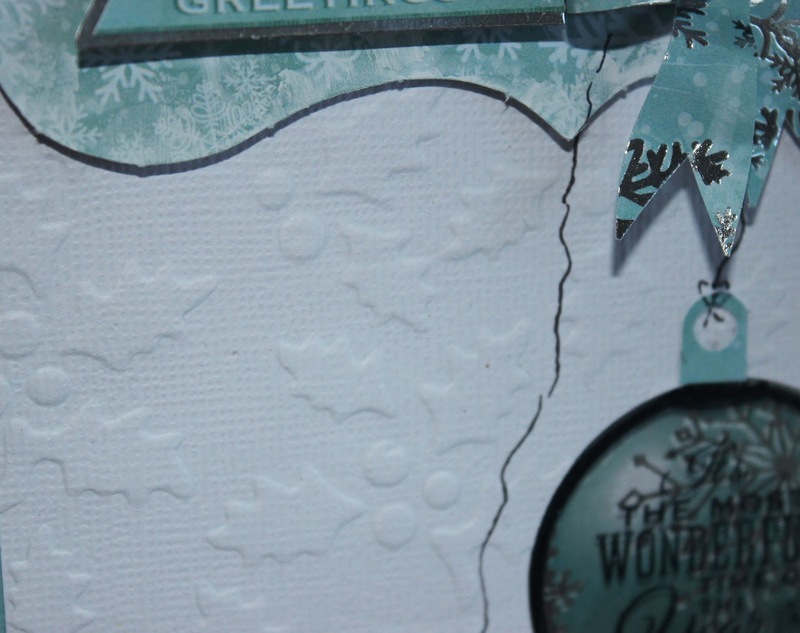 I have used a stencil to create the embossing in the white bazzill. 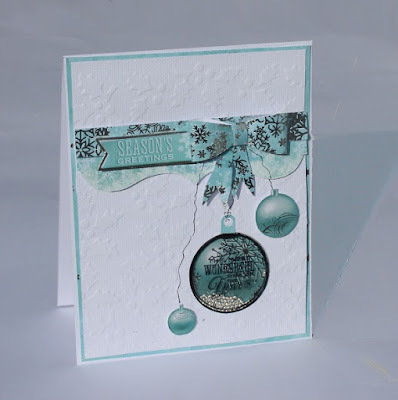 This was done by sending the stencil through a Big shot with the embossing mats (Silicone Rubber Mat and Texturz Impressions Pad) and the bazzill. 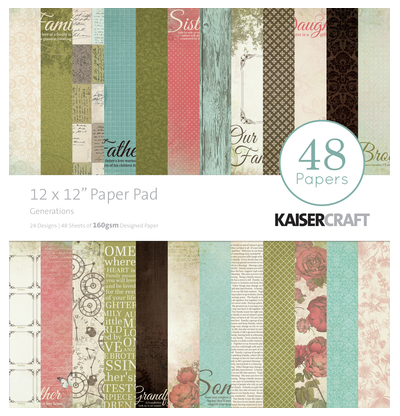 Kaisercraft Products: Paper Pad, CT837 | Collectables, CS700 | Clear Stamp-Silver Bells, IP719 | Black, RS403 | Coconut Weave Cardstock CD 101 | Template T623 Christmas Quarters (used as embossing folder). 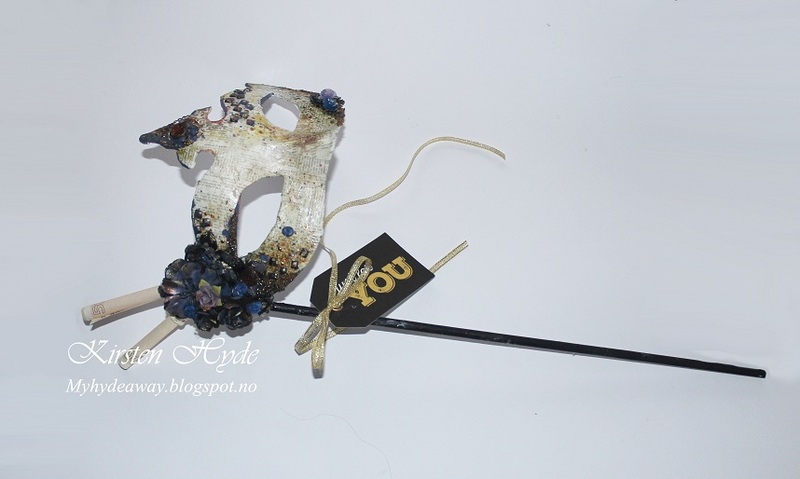 Other: Silver beads, 3D foam tape, acetate. It is time for a new challenge on Kaisercraft's blog. This time, it is a Mood Board challenge. 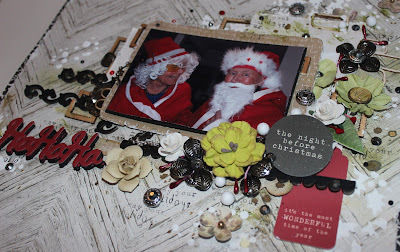 This is my take on the challenge made with the Home for Christmas Collection. 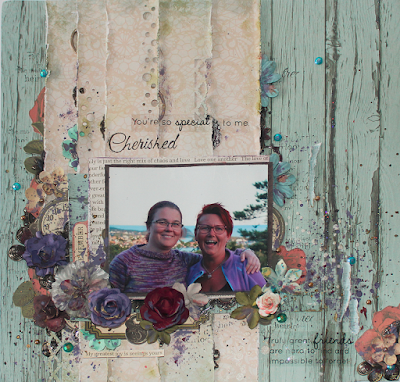 The layout is a mixed media layout. I have used mists, ink, stencils and stamps on the background. 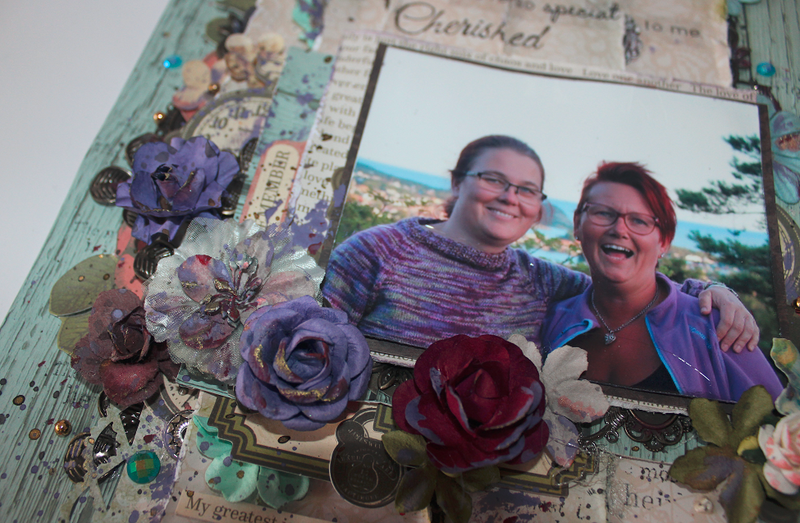 I have added papers, flowers, beads, metal, dies and the photo in layers. Kaiserctaft products: Paper: P1936 Suger Plum | PP980 Paper Pad | CS238 Clear Stamps | CT838 Collectables | Dies: DD120 Ho Ho Ho | Flowers F633 | Template T623 Christmas Quarters | Kaisermist KM102 Antique Gold | Ink pad IP733 Vine, IP730 Avokado and IP719 Black. 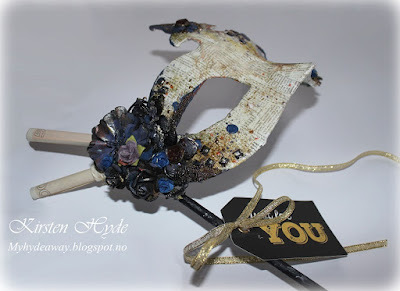 Other: Metal, beads and gesso. Pop over to Kaisercraft's blog to join the challenge. During the summer holiday, I got my first Kaisercraft parcel, as a part of the Design Team. Kaisercraft really spoil us with collections and stash. 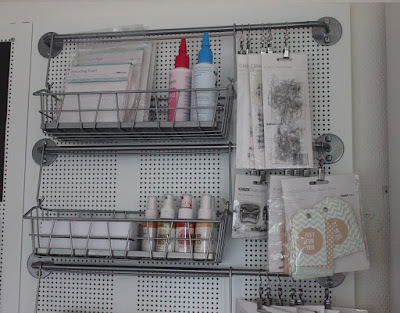 I wanted to keep my Kaisercraft things separate from my other craft stuff to make it easier to work with the DT tasks. For a few months now, I have stored the stash in card board boxes until I found a good storage solution. 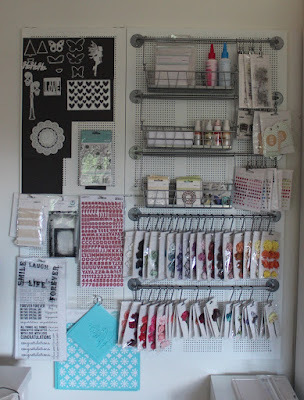 I wanted something mounted on the wall, where I can see all the products. I thought about getting some interior from a shop, but didn't find any suitable. 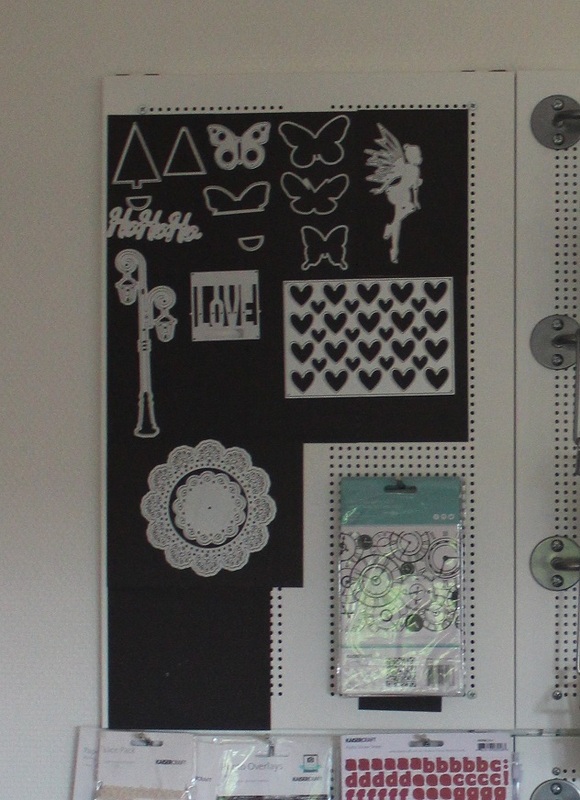 So I decided to wonder around IKEA, to see what I could find.This is what I came up with. 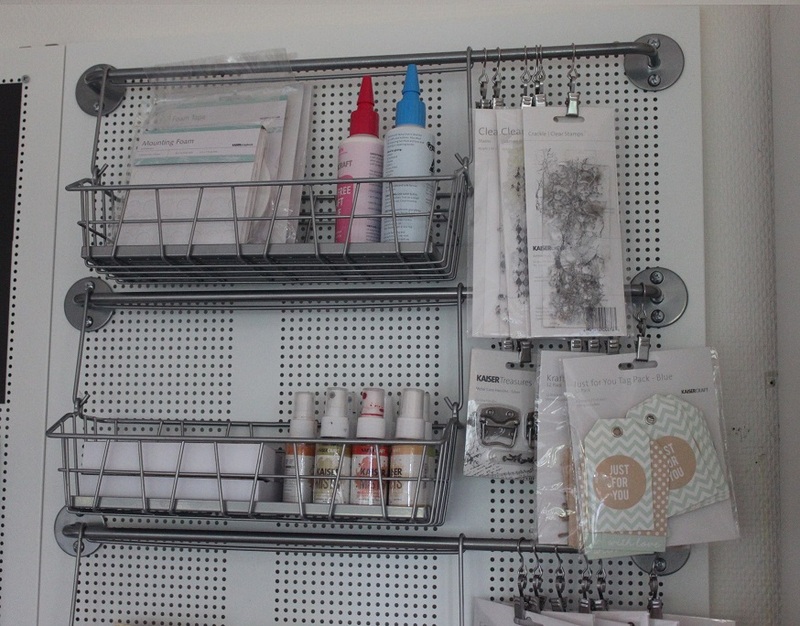 I have also added BYGEL Rail from IKEA. 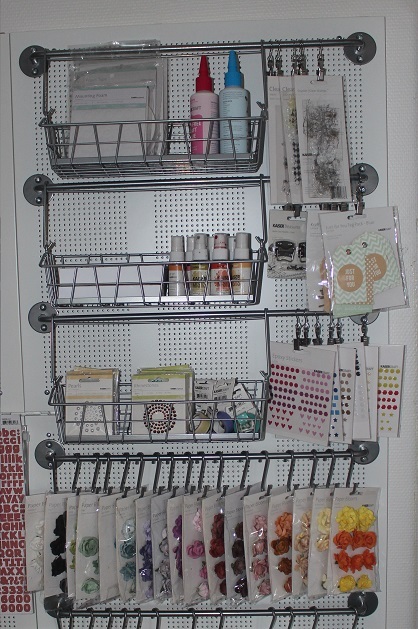 The screw holes on the rails fits exactly into the holes on the shelves, with the same spacing between the holes. 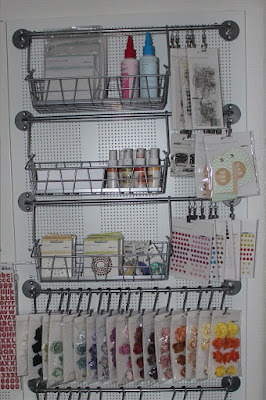 I have also added BYGEL wire basket and S hooks, I also got a set of RIKTIG curtain hooks from IKEA with clips and hooks for tool storage. These curtain hooks will slot onto the rail, if you bend/open the hook slightly at the top. 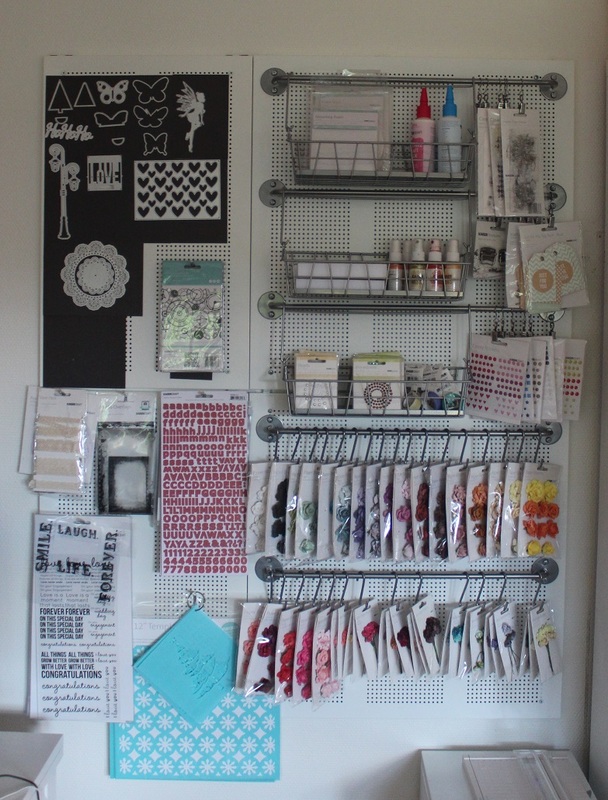 Kaisercraft dies come with magnetic boards. These boards can go straight onto the shelves, as they are magnetic. 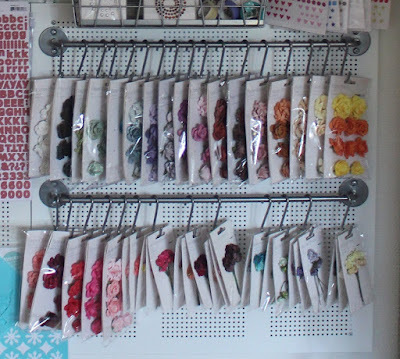 This is an easy way of storing the dies. . The flowers are sorted and hung from S hooks from the BYGEL Rail.